One of the clear favourites for line honours as well as the handicap prize in a big boat race. 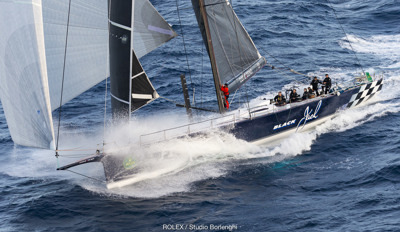 Third to finish last year and claimed the line honours in 2009 as Alfa Romeo. The team started the season in fine form by taking line honours in the Noakes Sydney Gold Coast Yacht Race and in the process beating both Wild Oats XI and Comanche. Owner Peter Harburg and skipper Mark Bradford have again assembled a top-class crew and with more under-the-water modifications she could easily lead the charge south. Australian Olympian Anthony Nossiter and New Zealand America’s Cup hero Brad Butterworth will look after the tactical side while Australian Tom Addis will handle navigational duties.